Rediff.com » News » Did Cabinet okay Pak JIT visit to Pathankot? Did Cabinet okay Pak JIT visit to Pathankot? 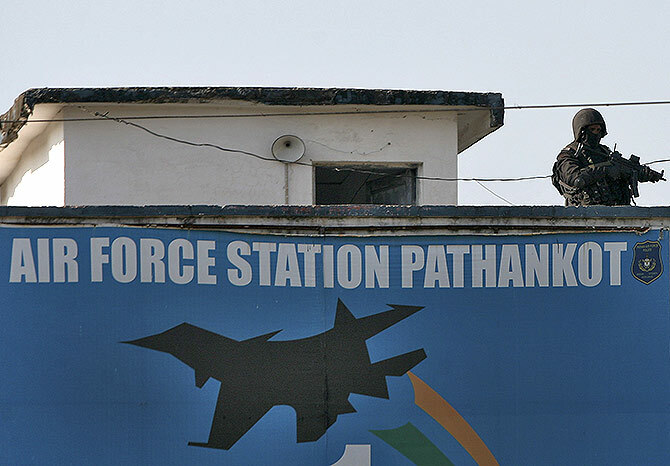 Security experts are aghast at the Modi government's decision to allow a Pakistan Joint Investigation Team comprising ISI and counter insurgency experts to visit India's largest air force in Pathankot on Tuesday, March 29. Permission for this team was granted in the face of stiff opposition from Home Minister Rajanth Singh and Defence Minister Manohar Parrikar, both of whom went public expressing their reservations about the visit. Minister of State for Defence Rao Inderjit Singh also stated that the Pakistani JIT would not be given access to such a sensitive military installation. "This is the equivalent of Assad fighting ISIS and then if talks were to go on between the two sides, he would ask ISIS to come over and check his military installations," says defence expert Maroof Raza. "It is obvious our armed forces have been forced to fall in line," says Raza, a former officer in the Indian Army. "What you are doing is baring all your details to an enemy country. You are exposing your infrastructure to them. They will check your levels of preparedness; they will see first hand how their jihadis came in, where they went and other details." "They will learn your Standard Operating Procedures and people know that SOPs in one base is not going to be very different from another," he adds. "They will know what to plan for in subsequent attacks." Appalled at this government initiative, Raza believes, "The armed forces have literally made the equivalent of a Faustian agreement with a couple of peaceniks in North Block, otherwise it is mind boggling how such permissions could have been given." "The ISI will go into our base and be host to a variety of strategic information," says a senior army officer, speaking on condition that he would not be identified for this report. "From where did the terrorists enter, from which area did they fire... all such information will be provided to them. Will Pakistan allow R&AW and Indian armed force officers access to roam around their strategic bases? Is there any precedent anywhere in the world of such permissions being granted? Obviously, they are not going around with blinkers in their eyes," the senior army officer adds. "Such a step is not being done to clarify our intentions which are known to the world, but by getting them here and allowing them inside our air base, it is not going to help change Pakistan's intentions," says Dr Ajay Sahni, director, Institute of Conflict Management. "Why do we need confidence building measures? Am I waging war against Pakistan? Why do we as a nation need to build their confidence?" asks Dr Sahni. "This is all political spin doctoring that is going on by people within the Indian establishment who have no concept of strategy. The army top brass is fuming as is the home minister." "No Cabinet decision was taken to allow these people to come in. It is a decision taken by a handful of individuals who have access to the prime minister," says Dr Sahni. "Today, we live in a world where Google maps show all the details on the ground which must be provided to Pakistan by Chinese satellites," says Ambassador G Parthasarthy, a former Indian high commissioner to Islamabad. "Our security people are sensible enough to conduct the Pakistani JIT to our airbase without compromising our security. They will be taken on a closely guarded and monitored tour in order that they carry out their investigation," says Parthasarthy, a former army officer who served in the Pathankot area in the 1965 War. By permitting the Pakistani JIT to visit Pathankot, Parthasarthy believes, "India is addressing a world audience -- to show we are willing to go to great lengths to end conflict in this region." Asked if Israel would do the same for Palestine, he retorts, "We are not Israel and Pakistan is not Palestine." "We are living in a real world," the ambassador says. "It is a world of diplomacy and we need to draw a line between diplomacy and security. I do not think our present military establishment is so foolish to compromise our security. We will show them where the shooting took place and where we shot their guys." Raza does not agree with Parthasarthy's assessment. "Google Earth can provide you with pictures," he says, "but it does not go into the finer details. You have to go on the ground to see the situation which is what we allowing them to do." "Pakistan is pretending they have no role in sending these jihadis to India," says Raza. "They are considered strategic assets. They are their modern warriors." "Pakistan is determined to challenge the rise of India economically and by targetting us, they are increasing costs for us, both internally and externally." This will be the first time an ISI officer will visit India to investigate a terror attack, in which seven Indian security personnel died. India okayed the Pakistani JIT visit after External Affairs Minister Sushma Swaraj met with her Pakistani counterpart Sartaj Aziz in Kathmandu on the sidelines of the SAARC ministerial meeting on March 17.